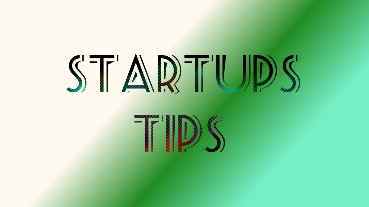 We have compile 9 Startups tips to give you that motivation you need to start your own business. 1. Move out of your comfort zone. You can only grow if you are willing to feel awkward and uncomfortable when you try something new. Take that bold step and don't look back. 2. Believe in yourself, your abilities and your own potential. Never let self-doubt hold you captive. This is what defines success. 3. Your greatest risk is in thinking too small. Think big Life Is too short to think small. Align yourself with the right mentor. 4. In developing countries, people tend to see more opportunities to start a venture than in developed countries. 5. Never limit yourself to what you can't do, but to what you have the power to do with what you have. 6. Many people dream about being an entrepreneur starting their own business, working for themselves, and living the good life. Very few, however will actually take the plunge and put everything they’ve got into being their own boss. 7. Passion, creativity, and resilience are the most crucial skills in business. If you’ve got those, you’re ready to embark on the journey. 8. Any goal worth completing is not going to be easy. The first step is dedicating yourself to a goal and knowing that it will not be easy to complete it, but it will be worth it. 9. 82% of startup today are self funded, 41% loans, 24% friends & family, 3% Crowd funding and 1% venture capital. what is your excuse? Start your journey to success.